It was the memorable high school summer music programs at Northwestern University that struck a chord in Aaron. He has musical lineage, in that both his father and grandfather were choir directors in church. But it was his great high school experiences that led him to pursuing it as a career himself. After studying at St. Olaf and receiving his Bachelor of Arts Degree of Music in Music Education, Aaron had the opportunity to complete his student teaching in 2016 under our very own Paula Holmberg, director of Minnetonka High School choirs. The following school year, he joined as the choir director at MME, where he taught all of the sections of the boys’ choirs as well as some sections of the 6th grade girls' choir. Mary is in her sixth year as director of the Choristers, Varsity Men’s Choir and Varsity Madrigal Singers. She brings lots of prior teaching experience with time spent in Eden Prairie, suburban Chicago, and Cincinnati school districts, where she received a Sycamore Schools Excellence in Education Award. She has also been honored, by invitation, to conduct the Wisconsin ACDA Middle School Honor Choir. She has continued to serve within ACDA, where she was coordinator for the 2011 North Central ACDA Honor Choirs. Most recently, Ms. Wiersum’s Choristers Choir was selected to perform at the ACDA’s 2015 State Conference. She also presented a workshop on music literacy at the ACDA 2016 Middle School Forum. Mary holds a Bachelor of Music degree in Choral Music Education with dual performance emphasis in piano and voice from the Lawrence University Conservatory of Music. Her private voice and piano students have received ACDA and MMTA awards and have been cast in professional theaters throughout the Twin Cities. She herself has performed with the Minnesota Chorale, Madison (WI) Opera, Madison Symphony Chorus, Minnetonka Theatre, and as soloist with church and community choirs. An accomplished pianist, Ms. Wiersum has also performed regularly as an accompanist for local school districts, church organizations, and ACDA events. This choir is selected by audition, for men and women grades 10-12. They participate in four major concerts, a state contest, and an annual tour to a domestic or international destination. This auditioned choir is for women in grades 10-12. They sing in four major concerts, participate in the Lake Conference Treble Festival, compete in the state contest, and travel on an annual local tour. 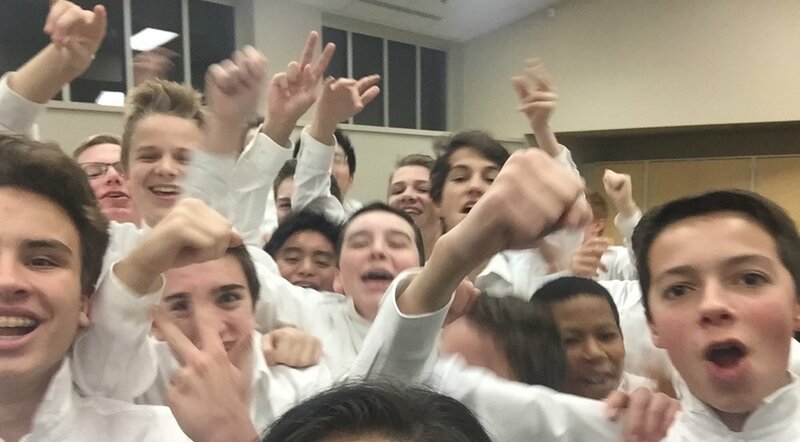 This nonauditioned choir is for men in grades 9-12. They sing in four major concerts, participate in the Lake Conference Varsity Festival, and perform the National Anthem at local events. This auditioned choir is for women in grades 9-12. Freshmen women with advanced sight-singing and aural skills are encouraged to audition. They participate in four major concerts and Lake Conferences Varsity Festival. The nonauditioned choir is only for freshmen women. They sing in four major concerts and participate in an annual retreat. This auditioned mixed ensemble is open to Concert Choir members. This group sings in school and around the community 40 to 50 times a year. Their repertoire includes chamber music and pop/jazz styles. This auditioned women's ensemble is open to Concert and Treble Choir members. Their repertoire includes chamber music and pop/jazz styles. This auditioned mixed ensemble is open to choir students in grades 9 and 10. Their repertoire includes songs that build a cappella singing skills. If you are a student or a parent of a student who is interested in choir, we would love to have you join us.